Choose own immediate reward on every purchase of housing units Cluster Wahana Mas Residence. Starting from sofa sets, 32 inch LCD television, air conditioner units (ac) 3 / 4 pk, blackberry gemini, to free the land rights certificates and the deed of sale. Promo instant prize is valid from 14 October until next month. Using the concept of occupancy, the cluster located in the area of Batam Centre has an extensive park facilities and also around the housing. Varah said, as marketing executive of PT Indo Utama Mandiri, far more people are buying houses for investment, but rather the cluster was built for occupancy is not just an investment. So, as much as possible the concept of home is made more forward the socialist aspects. For example, with a garden that can be exploited residents to socialize, and also the rule to not allow use the fence so that the life of more established neighbors. 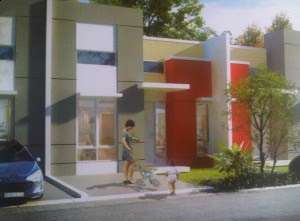 "Wahana Mas Residence Cluster was built for occupancy, so it is not just for investment. During this exhibition we give a direct gift promo. To purchase the type of housing unit 45, prospective buyers can choose a prize of a sofa set or a 32 inch LCD television. For the purchase of housing units type 45, direct gifts to choose from namely ac 3 / 4 pk or blackberries gemini series. As for the free land rights certificates and the deed of sale and bought it applies on every purchase of any type of housing units, "said Varah. In addition to park facilities are extensive and exclusive, you prospective buyers can get a full 24 hours security facility. For the price offered calls are still very affordable, for the price of 45 types ranging from Rp.195 million to Rp.203 million. Type 38 itself, priced starting at Rp.170 million to Rp.208 million. Payment transactions can be done in three ways, ie, hard cash, cash installment, as well as home loan. Interestingly again, added her every hard cash transactions and cash payments gradually, prospective buyers can still get a discount on the selling price of housing units. For prospective buyers who carry out hard cash transaction, is entitled to a discount of 20 percent of the sales price. As for prospective buyers who make payment in cash transactions gradually, given a discount of 15 percent of the sale price in installments as much as 18 times. For those of you who are interested visit the exhibition stand immediately Cluster Wahana Mas Residence on the 1st floor Kepri Mall. Or contact 0778-7055588/0778-7055599.